Movie Makers has just released a new documentary which I recently had the privilege to review. 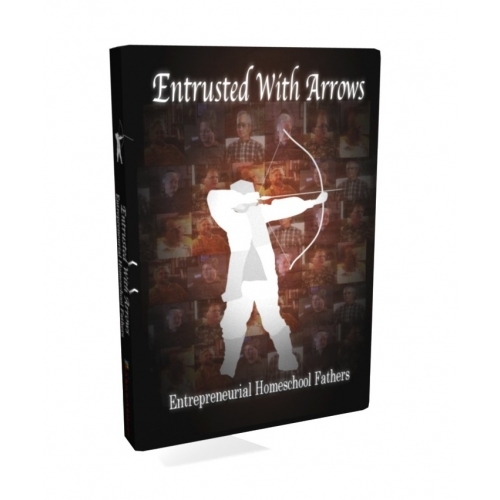 Entrusted with Arrows: Entrepreneurial Homeschool Fathers, is an hour long documentary challenging ordinary men to be extraordinary fathers. Statistics show that the average father spends less than seven minutes of quality time with their children each week. Perhaps just as alarming, statistics also show that children in Christian homes are being raised without a biblical worldview. These children in turn reject the faith of their parents when they reach adulthood. The film highlights fathers who have rejected the world’s standards. They have embraced a more biblical model because they understand that they are called to disciple their children. We get a glimpse into the lives of average men who have chosen to not just educate their children at home, but have chosen to come home and lead in the discipleship of their children. The common denominator in all these families is their faith in God. We see God open doors as they start home businesses. They stay with their children on a regular basis and follow the commands of God to teach, train, and disciple. As they follow in obedience, we see God bless these families. This film is encouraging and uplifting, pointing us to God and His will for Christian homes. It is a must see for those whose hearts desire is to follow God in every area of their life.